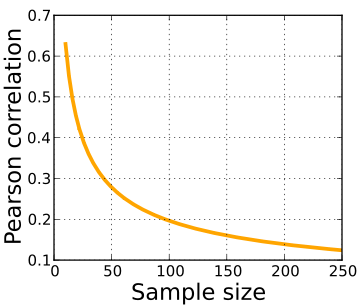 From Wikipedia Commons: A graph showing the minimum value of Pearson’s correlation coefficient that is significantly different from zero at the 0.05 level, for a given sample size. There are two new and very exciting frontiers being explored by the hockey analytics blogosphere. There is the manual tracking of zonal statistics, such as zone entries and exits. This area of research was first pioneered by Eric Tulsky and Corey Sznajder. Then there is the splicing of Corsi into microstates, such as looking at shot attempt differentials momentarily after face off wins or loses in particular zones. The early workers on these numbers were Tyler Delow and Muneeb Alam. I recently was able to get data from the non-NHL hires named above (and will enjoy their contact while I can until they are picked up too). Sznajder provided me with zone entry and exit data for just over 60% of the NHL. If you would like to check out his project and contribute, check this link. Alam sent over shot attempt events 10 seconds after a defensive zone face off, which was further separated into wins and losses. I originally received this data for study of the Jets and noticed what appeared to the eye to be a relationship, and wished to delve in further.